Champion of the Heart is now available at the Diesel eBookStore. Champion of the Heart is now available at the Diesel eBookStore. 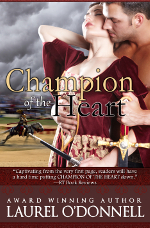 If you like medieval books with knights, tournaments, haunted castles and a passionate love affair, then give Champion of the Heart a try. This entry was posted in Blogs, Medieval Romances and tagged champion of the heart. Bookmark the permalink.